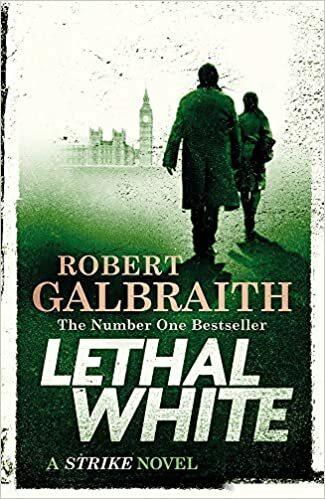 Lethal White is the fourth novel in Robert Galbraith's Cormoran Strike series and has a complicated plot involving blackmail, murder, hypocritical far-left activists, an obnoxious hard-right Tory minister, the Conversative/LibDem coalition and an appalling family of utterly terrible posh people who have nicknames like Fizz and Pong and wear mustard-coloured trousers. And that's just the mystery element: woven into all this, we've also got the ever-present problem of the relationship between Strike and Robin, who at the end of the previous book, went through with her wedding to her childhood sweetheart Matthew, readers worldwide screaming 'Nooooo!' as she walked down the aisle. It's perhaps not surprising, then, that Lethal White runs to 650 pages - considerably longer than the average detective thriller. Whether Robert Galbraith would have escaped the editor's pencil to quite this extent if he wasn't the alter ego of JK Rowling, I'm not entirely sure - but still found myself perfectly happy with the novel's length. There are so many elements to this mystery, brought together with such remarkable skill, that every page was a pleasure. The mystery plot alone is a remarkable achievement, absolutely packed with clues that build up to a satisfyingly neat conclusion I'd defy even the most seasoned crime fan to predict fully. Added to that, Robin and Strike are such utterly likeable characters, despite their many flaws, that it's a joy to spend so much time with them. As in the previous books in the series, the supporting characters in Lethal White are slightly larger than life: this isn't gritty realism, but it's not supposed to be. I've said of the other Strike books that they're much more akin to Golden Age detective fiction than today's police procedural thrillers, and this is evident in Lethal White too. That said, Galbraith does take the step of introducing an element that is often conspicuously ignored in other detective novels: Strike, having solved three high-profile murder cases, is now a minor celebrity, and with fame comes unwanted attention that plays havoc with his surveillance work. That fame also means he can attract a more prestigious clientele - in this case Jasper Chiswell, the Culture Secretary about to preside over the London 2012 Olympics - but at the same time means he becomes a target for fixated obsessives like poor, delusional schizophrenic Billy. This book also has something of a state-of-the-nation feel. AntiSemitic, gaslighting Marxist activist Jimmy and his patronising, middle-class mockney girlfriend Flick will certainly seem very familiar to anyone who follows left-wing politics on social media. The hideous Chiswells, an over-privileged uber-Tory dynasty, also ring true ... as do the observations on London's rental market, in which working adults are crammed two to a room in properties with no communal living space. As for Robin and Strike - well, we know Robin married Matthew at the end of Career Of Evil, and I found the progress of Robin's marriage very convincing (Strike's own relationship situation is rather less so, although the return of his unstable, abusive former partner Charlotte certainly adds interest). To say any more would be a plot spoiler, but there's a certainly plenty of mileage left in the will-they-won't-they storyline that runs through the series.